Do you stand in front of your closet thinking I have nothing to wear even though its full of clothes? I do this all.the.time. It drives my husband crazy because my closet seems like clothes are exploding from it half the time and my dresser drawers are way too full when all the laundry is clean. Its frustrating to him, but he does the same thing when he looks through the kitchen, he always says there is nothing to eat. Its true that I keep very few packaged foods on hand these days; there is usually a box of crackers and some granola bars for lunches but other than that, its pretty much pantry staples. Not exactly nothing to eat, but since he doesn't cook, he doesn't see the potential. Evidently I need a fashion consultant or something, so I can start seeing some potential in my closet. Or a new wardrobe - shopping would probably be more fun. Keeping a well-stocked pantry makes it much easier to always have something to make for dinner. You won't need to run to the store 3 nights a week to pick up something or call for pizza. At a minimum, I try to always keep canned tomatoes, dried pasta in several varieties, vinegars, oils, mustard, chicken stock, garlic, rice, flour, and sugar. In addition, I always have frozen vegetables in the freezer, lemons and limes, and onions. I also grow fresh herbs so I can add oregano, thyme, basil, cilantro, or parsley to add more flavor. And of course, there is always wine on hand. For this pasta dish, the sauce is a simple cheese sauce, similar to any macaroni and cheese recipe, started with a roux made with flour and butter. A little white wine, onion, garlic, Dijon mustard and then the delicious sharp white cheddar cheese. Add some chicken, some thyme and oregano and sprinkle on some red pepper flakes and you'll have a great meal in just a few minutes. Heat olive oil in a large skillet over medium heat. Mix together mustard, thyme, salt and pepper and sprinkle over chicken pieces. When pan is hot, add chicken and brown about 3 minutes per side until cooked through. Remove to a plate and cover with foil. Heat water to boil in a large stock pot for pasta, add salt and pasta and cook to al dente and drain according to directions. Meanwhile, melt butter in a large skillet over medium heat. Add flour and whisk to combine. Add wine, garlic, onions, and mustard. Cook about 5 minutes, until onions are translucent. Reduce heat to low and slowly add milk, stirring to combine. Cook about 5-7 minutes more until mixture begins to thicken. Add cheese and stir to melt. Add chicken and pasta and toss to incorporate sauce. Add thyme and oregano and serve topped with crushed red pepper flakes and Parmesan cheese. Oh wow, that sounds and looks so good. With the exception of the Dijon mustard, I have everything else on hand normally so I can't wait to try this. Even though we don't eat mustard, I probably should have it on hand anyway because other people do! Thank you for this recipe, I think this might be dinner tonight. My husband is the same way. I can go spend $150 at the grocery store and the next day he'll look in the pantry and the fridge and complain there's nothing to eat. Then I come up behind him and name off a seemingly endless list of possibilities. *sigh* Men. lol. I just put this in the crock pot... Realized I misread the recipe. I thought it said 1.8 oz cream cheese. Do you think it'll turn out ok?! I believe you also are making a different recipe than my recipe listed above. I'm guessing you got the link on Pinterest and it's a completely wrong recipe that someone is posting with my stolen picture. I believe it's linked in the comments farther down the page so you can reference that. Yours sounds like it would be much better! The recipe she's looking for is called Crockpot Italian Chicken. It's listed under a different picture and recipe on pinterest but if you click on it the link takes you here. Not very helpful when you're trying to make that recipe. My stomach is growling for this! 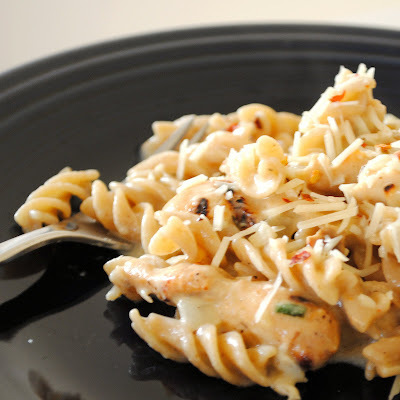 Pasta, cheese, chicken....YUM. YUM! I love it when you can make a yummy dinner from your pantry and fridge! It tells you to add the wine with the garlic, onions, and mustard. @Jenna -- Thanks for the comment - I revised above. Glad you liked it! Wow this looks so good! I will def be trying this soon. This looks amazing! I can't wait to try this. This was really delicious! Next time I would cook the onion in with the chicken rather than the sauce. I think you could really modify this for a wide variety of flavors using the same method. I liked how easy it was to make such a rich sauce without having to use heavy cream. That's a great idea, I'm going to try that next time. Thank you for this recipe. I'm new to cooking, been doing it for about year and I'm always looking for recipes to try and this looks really yummy. I'm also looking for some easy slow cooker stuff so if you know where I can find them please share. Thanks. Great blog! Now I'm hungry, lol. How many servings does it make? It doesn't say above either. Please add thanks!! Looks amazing and I really want to try it! @krissy - you could get 4-5 main dish servings from this. Sorry I didn't include this information originally. i made it tonight and nobody liked it. The sauce looked, smelled, and tasted delicious until I added the cheddar. It was globby, thick and never the same. I don't think I reduced it too much, any ideas? The cheese just wasn't melty. Next time i'll use parmesan instead. @Shannon - sorry it didn't turn out for you. I'm not sure why that would have happened. Did you use a low-fat cheese or was there something else going on with the cheese? Does anyone know the weight watchers points on this recipe? I made this last night and it was delicious! I eye-balled all the amounts, especially in the sauce, and I was very happy with how it turned out. I cooked the onion with the chicken, as another commenter said above. Thank you! Yum, making this tonight. pinned it on Pinterest - thank you! I was wondering if you could omit the wine or substitute chicken broth for it? I don't keep wine on hand. Thanks so much! @Sara - yes you can sub chicken broth and it will be just fine. Made it! Loved it! Thanks for sharing your recipe! This stuff is delicious. I'm JUST starting to cook and it was my first time cooking in more than two pans, lol. Turned out great! Is there an alternate way to make this in a crockpot? @KatesContiki - I'm sure you could make it in a crockpot in a similar fashion to mac and cheese being made in a crockpot, but for this dish, I think it would be more hassle than it was worth. I'm wondering what yellow sharp cheddar cheese would do instead of white cheddar? is it only different in color and would the sauce taste the same? @Jennie - I do think there is a difference in taste but it's not huge and you can substitute regular yellow cheddar without a substantial difference in the outcome. My daughter found this recipe on pinterest and we decided to make it. I did cook the onion with the chicken...was delicious! I have shared the recipe with my co-workers! Thanks for adding another "favorite" in our recipe rotation! I made this tonight because I had everything on hand, which is a rarity for me. Heh. It came out pretty good, but I thought it was a bit too tangy, probably because I used buttermilk instead of regular milk because someone keeps drinking all my milk! Anyway, I also omitted the onions because frankly, I didn't feel like chopping them. I used whole wheat penne and it still tasted great. Overall a good weeknight recipe that uses stuff everyone has on hand. I will try making it again using regular milk and see how it turns out! Is there anything you can substitute the dijon mustard with? The mustard adds a good amount of flavor so leaving it out or replacing it is going to alter the flavor of the dish. Are you trying to sub because you don't have any or because you don't like it? You could maybe try using a small amount of mustard powder in place of the dijon if you are just out to still get the flavor. We found this on Pinterest, made it tonight. Was spectacular, Thank you for sharing. It was ok, not a lot of flavor. OK. Made this last night. AMAZING! I actually ate the left overs for my midnight snack. WOW. I NEVER replace my rocky road! Thank you for sharing! Did not care for this at all!!!! Too my thyme!!! Does anyone know the weight watchers points for this? Made this tonight. I used dried thyme instead of fresh b/c that is what I had. (I used 1 tsp dried instead of the 1 Tbsp.) I also grilled my chicken with the spices rubbed on. My family enjoyed this dish. Thank you for sharing the delish recipe!! This looks fabulous. I love that most of the ingredients are already sitting in my pantry so I just have to pick up some fresh thyme and oregano, and I can make this for dinner. Thanks for sharing! This sounds wonderful, but very confused. When I saw the picture of this recipe it had a caption that said it included zesty Italian dressing, cream cheese, and other items, but when I clicked on the recipe to see the directions these ingredients are no listed?! Which one do I follow? Sorry for the confusion. The picture above goes with the recipe above. Someone stole the picture on pinterest and put up the zesty Italian chicken recipe but it has nothing to do with my picture or my blog. Tried this tonight...I added the onions to the chicken; however the sauce didn't thicken up as much as I would have wanted. Don't know how necessary the thyme is because I couldn't really taste it. Other than that, it was good! Ashley - glad you liked it. If you want a thicker sauce, generally you just need to keep cooking it a couple extra minutes and it will continue to thicken up. I am so saddened this recipe I have in my crockpot does not belong to the delicious picture you have posted. I wish I had clicked on the picture first and came to YOUR recipe to try. I am sorry it was taken from your blog and given another recipe. I am planning on fixing YOURS next week!! Thank you, I hope the recipe you did make turns out well for you too! Is there a substitute I could use in place of the dining mustard???? I don't have any and I already started making this dish!! I assume you are subbing the dijon mustard... You could use a little additional dry mustard or a brown mustard if you've got that. Just adjust to taste. Yes I ment dijon mustard my phone does that sometimes.. how much dry mustard do you think I should start out with ?? I figured it was an autocorrect problem -- I would probably start with 1/2 tsp and go from there. Any idea on how mant calories per serving? We made this tonight. The chicken was great! The rest could be good if I hadn't over cooked the pasta. Thanks for sharing. Nicole - generally people use chicken broth as a substitute for white wine if they don't want to use wine or don't drink. Thank you for this recipe. Though I don't have white cheddar, I do have regular cheddar. I'm thinking of making this tonight, do you think subbing the one cheddar for the other will make much of a difference besides in colour? While I think white cheddar has a different flavor than regular, especially if you don't use a sharp cheddar, using regular cheddar cheese won't hurt you. You may want to adjust the spices a little just to taste since the cheese won't have as much flavor. This turned out great! I didn't add the dijon mustard as I didn't have any and it still came out good. My 8 year old loved it and told me that I have to make it again. I made this for dinner tonight and my family loved it. I did have a few changes. I added the cubed raw chicken to the other "chicken" ingredients and marinated it in the fridge. I cooked the onions with the chicken. After the cooking the chicken I cleaned the pan with some Moscato wine and then added the butter, flour, etc. I also added some cooked broccoli and my family loved it. The sauce has a really rich flavor. Our store doesn't sell white cheddar so I bought the Kraft shredded triple cheddar. It was a family favorite for my husband and 3 young kids. Made this for dinner last night, and the family didn't like it. Between the vinegar and dijon mustard combined with a sharp white cheddar, the sauce was too tangy/acidic. The dish was also too herby, I think from too much thyme. If you are looking for a rich creamy cheese sauce, this dish does not deliver. If you are looking for more of an upscale/adult flavor profile, this dish may be more for you. Happy cooking! Sorry you weren't a fan... it is more of a grown-up mac n' cheese type recipe. This looks so good and I want to make this for me and my friends in college! How long is the prep time and the cooking time so i can prepare with my crazy college schedule? You could do everything in about 30 minutes... maybe a little longer if you aren't real quick in the kitchen normally. Hope you enjoy! I just made this for dinner and it was spectacular! I didn't have any thyme on hand, so I substituted with a pinch of basil and it was still delicious. Also, for the person who posted today that is in college, I am also in college and I whipped this out in about 40 minutes (and I am in finals week!) 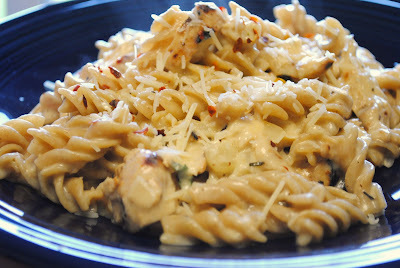 Thanks for this recipe; it is now a weeknight staple in my apartment! I can't wait to give this a try! In fact I am making it tomorrow. It will be wonderful to see how everyone likes it - I know I will love it by the ingredient list alone! I have a bunch of people I would like to make this for and was wondering how many this serves. This recipe makes 4-5 main dish servings. Oh my goodness it was so good! If anyone is reading this and is having doubts about making it, I can testify! Go for it! It was super easy and didn't take as long to make as you would think it did if you tasted it. I'm telling you, it tasted like something out of a restaurant! Absolutely amazing! I will make this again and again! looks and sounds delicious.. although I feel the need to tell you, I was brought to your site via a pin on pinterest about crockpot chicken. "HOLY MOLY it looks good! Crockpot Italian Chicken: 4 chicken breasts, 1 packet Zesty Italian dressing seasoning, 1 8 oz. cream cheese (softened), 2 cans cream of chicken soup; Cook on low for 4 hours. If sauce is too thick, add a little milk. Serve over pasta. Wowzers!" Thanks - someone posted the recipe and stole my picture and then it got posted to pinterest and I've gotten several comments because of it - some from people who don't realize they don't go together until they've made the crockpot recipe. Unfortunately there isn't anything that I know of that I can do about it since the link goes to my blog, I have no way of finding the original posting so it can be removed. I hope you like my recipe! I came from the same pinterest link. must say though, this recipe looks way better and I will definitely be trying yours. I got this recipe from pinterest and clicked on the link and it is something totally different. I already put in the ingredients in the crock pot and started my dinner. That is so frustrating. I hope it turns out! Sorry I understand your frustration, I wish I could fix the problem. I don't have dry white wine but do have white cooking wine, is that okay? Yes it will be fine. I like to use a wine I would drink, rather than buy cooking wine but that's just personal preference. this dish looks delicious! 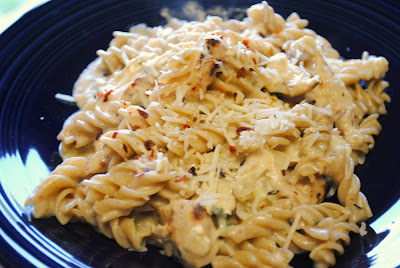 I am a big fan of chilis cajun chicken pasta (without the cajun spices) and was wondering if anyone knew how this dish compared in taste? It looks very similar so didn't know if it was the same concept minus the cajun spices of course. Also is there another type of cheese you can use besides the white cheddar and the obvious choice of parmesan? Thanks for such a tasty dish. Wow am I naive I didn't know "identity theft" was going on with cooks on Pinterest & saddened by that. I will try your recipe & especially liked your comment Of course there's always wine on hand. I don't have fresh tyme, how much dried tyme should I use? I would go with 1/2 to 1 tsp of dried thyme. Dried herbs are much more concentrated than fresh so add it a bit at a time to your tastes. How much should I cut down the thyme and oregano since I only have dry herbs? I have white munster cheese would this be better than regular orange cheddar? I would go with 1/2 to 1 tsp of dried thyme and oregano. Dried herbs are much more concentrated than fresh so add it a bit at a time to your tastes. Muenster would be fine if you enjoy the flavor of it. Personally, I'm not a fan of it so I would go with a regular sharp cheddar but if you prefer muenster, go for it. I'm featuring it on my site Dealcupcake.com tomorrow. Thanks again! my family loved this. any clue on nutritional stats? We thought this recipe was gross. We followed it to the letter and found it unappetizing. We ended up throwing it out :( It was a waste of a lot of food. had chicken out for the hubs and i for dinner. unexpected guests (6) oh NO.. so off to pinterest to find a recipe. yours looked perfect. i followed to d recipe pretty close with a few subs due to not wanting to go to the store. thankfully i had some fresh thyme in the herb garden. yellow cheddar. added some sundried tomatoes from the garden and a tiny bit of bell pepper for color. the dijon was great in the sauce. used penne pasta. served with green beans and garlic bread.. perfect for the 8 folks ( i made a bit extra sauce) and had more chicken than recipe states.. great recipe!! I have made this a few times and it's a hit with my family! Thank you!!! My husband and I are eating this as I type, we made it together tonight. Great results, we really like it. Thank you so much! Made this last night. Great recipe. Thanks for sharing! Made this tonite. Family including my soldier home from Afghanistan loved it!!! !thanks for sharing! I dont want to have wine in it. so how can i do it?? its just we dont drink wine so i dont want to buy wine for just this one recipes!! OMG... Thank you so much for this recipe! It's fantastic! I want to do this, but with less lactose and without distorting the flavors. This looks so amazing, that I'm scared to make the changes. However, my tummy says do it! Doing it! This was fantastic and simple to make! My boyfriend enjoyed it and when his sister and her friend saw he went back for seconds, they had to grab a plate! THANK YOU! I really appreciate you letting me know! I am making this tonight for dinner but when I added the wine to the flour/ butter mixture it thickened up and got chunky. I'm still cooking it though so I hope it turns out ok. So I am experimenting this recipe in the crock pot right now :) Cooked the pasta and have it in the refrigerator for now. I mixed the flour, white wine, butter, mustard, milk and spices in a medium bowl. Placed frozen chicken in the crock pot, poured mixture over chicken, and topped with the chopped onion and minced garlic. I've got it set at low probably for 8hrs or so. Going to fold in the pasta and cheeses when just about to serve. I did however forget to spice the chicken before starting this experiment.. but I'm pretty confident this will still taste amazing! Just made this and it is A-W-Esome! So creamy and delish! Made it exactly as its listed. can't wait to try it in the crockpot. Delish main dish! I would really like to eat some pasta right now. Looking at this delicious food makes me really hungry. Thank you for sharing the recipe! Now I know what I am going to cook tonight. My sauce seemed like ir was lacking something. I didn't add the dijon mustard bc i didn't have any on hand...and does T stand for tsp? T = Tablespoon so that might have been your issue. Also the dijon adds a good bit of flavor and depth to the sauce, I think it's definitely a worthwhile addition. Thanks for sharing this with us. I try it. It superb and delicious. But i used one lemon according to my taste. It's amazing, all my friends like my handmade chicken pasta dish. I never try it at home. I generally ordered it. Thanks a lot again. This was DELICIOUS! I added sliced mushrooms and chopped steamed broccoli, and it was sooooo good. My kids swallowed it all up! I made this for dinner tonight. It was yummy. Thanks for posting this recipe. I am a very busy person. I wanna make this recipe in my kitchen. How much time it will take to prepare this dish? The flavor was decent, but the flour clumped with the butter as I whisked it and didn't incorporate back into the sauce well. Sauce turned out grainy.